Jawbox Classic Dry Gin is a popular Craft Gin available from Amazon.co.uk in 70cl to buy online. Visit Amazon.co.uk for the best price for 70cl of Jawbox Classic Dry Gin or compare prices on our other Craft Gin products. Jawbox Gin is a single-estate gin made in Echinville Distillery, Belfast, which was the first to be granted a license to distil spirits in Northern Ireland for over 130 years. The spirit with which the gin is made is created onsite, from Barley grown on the Echinville estate. Eleven botanicals are then added: juniper, coriander, angelica root, orris root, grains of paradise, liquorice root, cubebs, cardamom, cassia quills, black mountain heather and lemon peel. Three of these 'a secret three' are vapour distilled to give a balanced, classic gin flavour. On the nose, fiery cardamom, juniper and a clean, bright citrus. 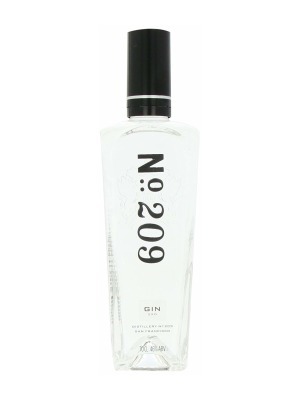 The classic notes come through on the palate, remaining juniper-led but with a little sweetness from the liquorice. Further citrus and a lingering juniper and pine finish. Jawbox is very much a traditional gin, the flavours stand up well to mixers yet, tasted neat it remains smooth and sippable. Add a sprig of rosemary to a Jawbox G&T to accentuate the juniper's herbal qualities, or use in classic cocktails, like a French 75 or Negroni. 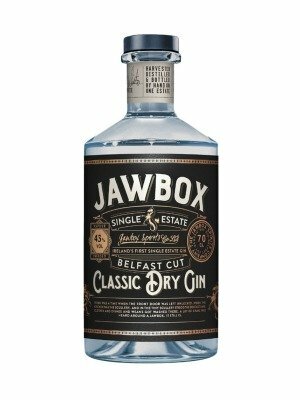 Where to buy Jawbox Classic Dry Gin ? Jawbox Classic Dry Gin Supermarkets & Stockists. You can buy Jawbox Classic Dry Gin online in most retailers and find it in the Craft Gin aisle in supermarkets but we found the best deals online for Jawbox Classic Dry Gin in Amazon.co.uk, TheDrinkShop, DrinkSupermarket.com, 31dover.com, Tesco Groceries, and others. Compare the current price of Jawbox Classic Dry Gin in 70cl size in the table of offers below. Simply click on the button to order Jawbox Classic Dry Gin online now.